Caravan routes across North Africa, including to Timbuktu, Mali. 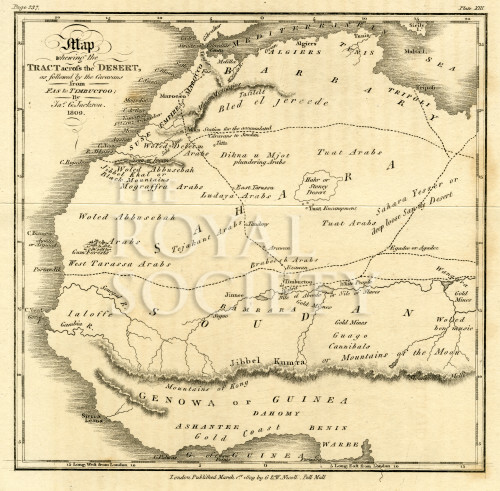 Showing the territory from ‘Barbary’, the Mediterranean coastline, south through the Sahara Desert and West African coast, to Sierra Leone, the Gold Coast and Benin. Plate 13 from the book An account of the Empire of Marocco, and the district of Suse… by James Grey Jackson (London, W. Bulmer and Co., for the author, 1809).